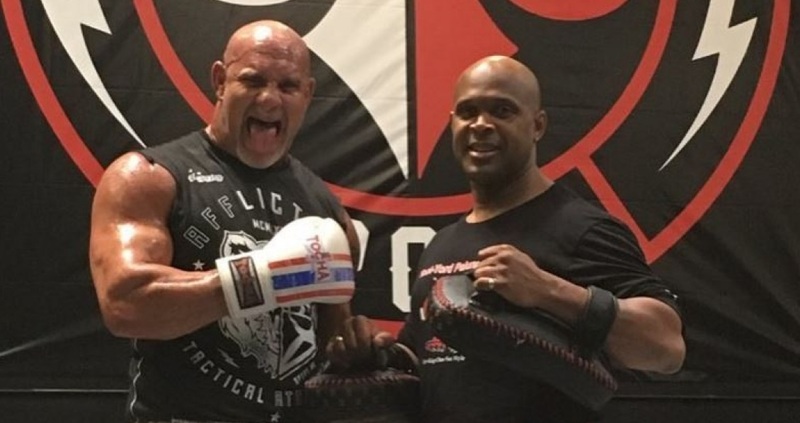 Master Level Muay Thai instructor Ruben Rowell Jr. has recently been working with famed pro wrestler Bill Goldberg at the Affliction Clothing Training Facility in California. Goldberg made headlines just weeks ago after announcing his return to the world of professional wrestling after a 12-year layoff. “Putting in some work yesterday at the Affliction Clothing training facility with Ajahn Kru (Master level) Muay Thai teacher Ruben Rowell Jr.,” wrote Goldberg. Goldberg has also been working with Duane “Bang” Ludwig and GLORY Kickboxing star Simon Marcus. Goldberg will return to take on former UFC heavyweight champion Brock Lesnar at WWE Survivor Series next month.